For children who are color-blind, red, orange, yellow and green may be different names for what they perceive as the same color. Children who are color-blind can see color, just not the same colors as people with normal vision. The American Optometric Association, or AOA, notes that up to eight percent of boys and 0.5 percent of girls are color-blind. If misdiagnosed, color-blind children can be thought to have learning disabilities, or simply to be lazy or inattentive in school. 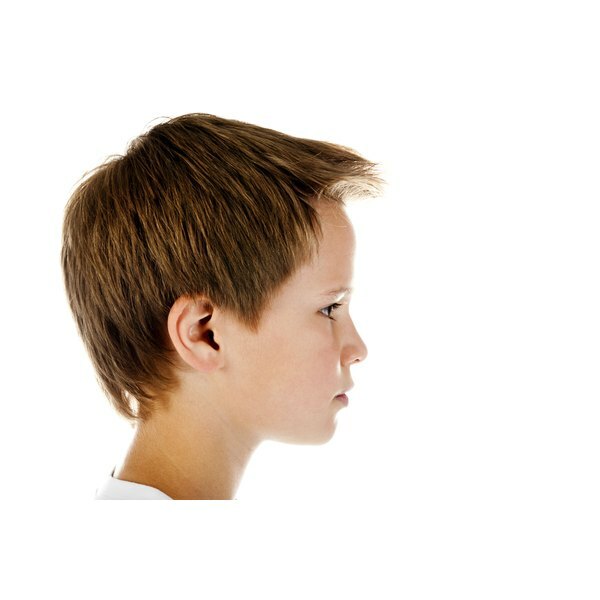 A simple test can determine a child’s color vision deficit. Most commonly, color blindness results from a genetic deficiency on the X chromosome that results in a lack of "cones" in the retina, reports AOA. Three types of cones in the human eye make color vision possible. Children who are color-blind can be missing some of one, two or all three cone types, notes Discovery Health. As a result, instead of being able to distinguish more than 100 hues, color-blind children can only see a handful of colors. Color-blind children will have a hard time recognizing colors. In particular, they will confuse pastels and other off shades. They may call their toys the wrong colors or draw pictures inaccurately, like Santa wearing a brown suit instead of a red one, notes Discovery Health. Children as young as the age of three can be tested for color blindness. Ishihara plates, also known as pseudoisochromatic plates, were created by Dr. Shinobu Ishihara for the Japanese army. This type of color-blind test is one of the most common, notes Discovery Health. Ishihara’s original plates have been modified to use numbers instead of Japanese characters, and they look like a group of color dots with a number in the middle made with different colored dots. To individuals who are color-blind, the plates look like just a group of dots; they cannot distinguish the number inside. Older children can still use Ishihara plates consisting of displays made up of different colored dots with numbers hidden inside. A similar test is used for younger children, but it contains simple objects hidden in the dots that young children would be able to recognize, like circles, triangles and squares, notes Discovery Health. A child who is color-blind won’t be able to see the numbers or objects hidden inside the dots. School can be very difficult for children who are color-blind because colors are so often used as tools to help teach, according to Discovery Health. Color-blind children will have trouble doing activities like "count the red beads," distinguishing certain shades of chalk on a chalkboard and reading certain colors of text off colored backgrounds, like purple text on a blue background. However, the diagnosis can help bring awareness of the problem so alternative strategies can be used at school and at home.